The morning started off by arriving at the historic Hermitage Hotel in downtown Nashville, TN. The Tennessee Flag was flying high over-head and the place was buzzing with florists, other vendors and bridesmaids wondering in. Ashton (the bride) came down to meet us to give us a rundown of her big day. The best way to describe this bride was bubbly and fantastic. She was not only a natural beauty but such a pleasure to work with. She was the quintessential bride, so excited for her big day! We knew we had a long haul ahead of us that day because we were hired for one of our biggest packages. We started at a bright and early 7am and didn’t leave the reception venue until after the departure of the bride and groom. I love filming weddings like this; you get to capture the whole day!!! We started off with the Bride, her mother and her bridesmaids in the governor’s room where there was hair and makeup galore. This was a most elegant wedding, floor length black gowns, black tuxes and very glam hair and makeup. By far one of the most attractive wedding parties I’ve seen and let me tell ya, I’ve been to my fair share of weddings… not just doing wedding videos but as a bridesmaid, a maid of honor, a guest and even as a coordinator! I’ve seen and done it all! This wedding and bridal party were fabulous! Every detail was perfect! From the bride’s gown that was created for her from her mother’s original wedding dress, to the groom’s cake that showed how they came from different parts of the world, the toasts by the father of the bride, Bob Davis and both the best man and maid of honor were amazing! The night was full of so much fun! The highlight of the night was definitely the dancing! The bride and grooms first dance was romantic and fun, then the father of the bride danced with his little girl and shocked us all with a choreographed number wearing Tennessee Vol orange sports Jackets! The laughs and applause didn’t stop! Once all the guests joined on the dance floor the fun didn’t stop till it was quittin time! The Bride and groom left through a sea of their guests, sending them off with embraces and warm wishes! 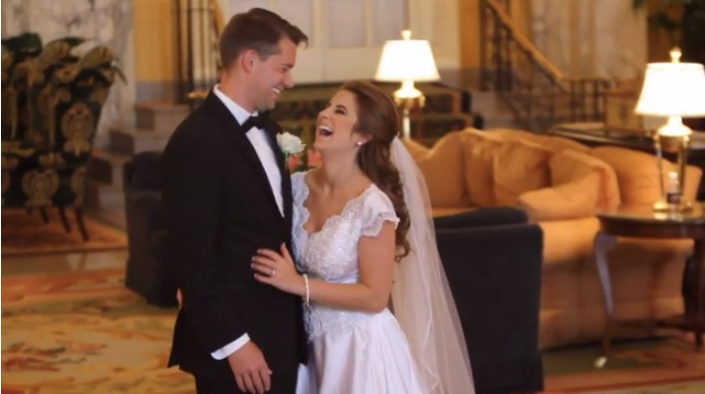 A beautiful exit to their getaway car the new Mr. and Mrs. Ryan Davies had a night to remember. I feel so blessed to have been a part of their wedding day and couldn’t be more excited to give them their finished wedding video to have and cherish for the rest of their lives!